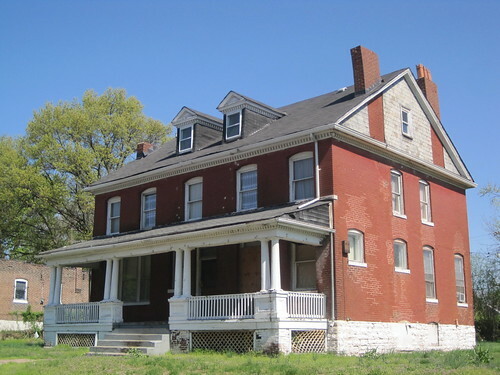 On January 17, 2012, the National Park Service listed in the National Register of Historic Places three historic districts in and an amended and expanded historic context for The Ville neighborhood. Due to lack of contiguous historic fabric, The Ville is not eligible for listing as single historic district. 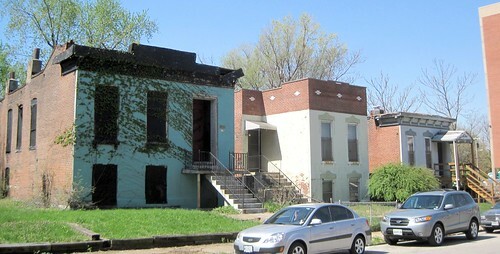 In 2011, the Cultural Resources Office of the City of St. Louis contracted with the Preservation Research Office to undertake an architectural survey as well as recommended National Register of Historic nominations to remedy the lack of National Register-listed, tax credit-eligible properties, and to guide demolition planning. 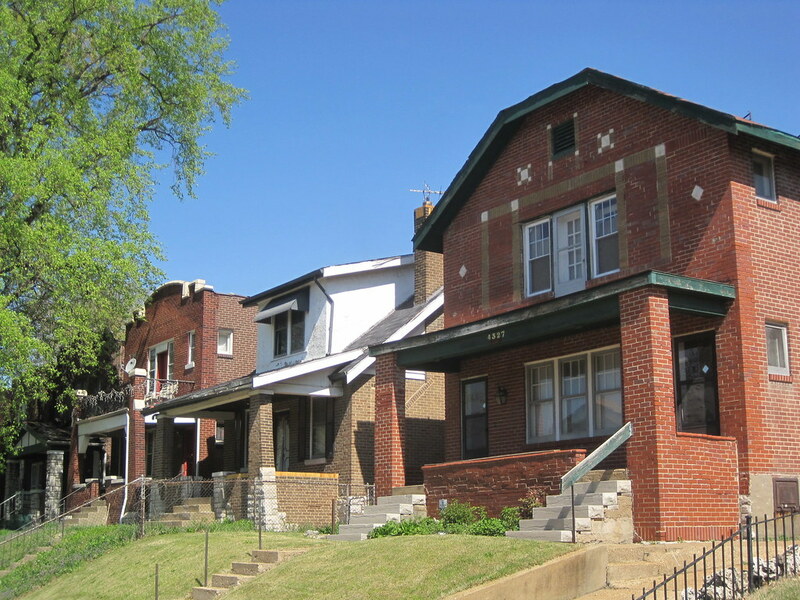 All National Register listings were made using the requirements of Historic and Architectural Resources of the Ville Multiple Property Submission (MPS), first created in 1999. The Herman Dreer House (built 1930) at 4335 Cote Brilliante Avenue is at left; it was listed in the National Register in 2009. Now the rest of its block is within the National Register-listed Marshall School Neighborhood in The Ville Historic District. Until the commencement of recent Ville cultural resource projects in 2009, The Ville MPS lacked a section that would enable listing of groups of residential and commercial buildings associated with general trends of African-American settlement between 1910 and 1950. Buildings had to be associated with significant institutions or individuals. Most building stock in The Ville is the backdrop for significant twentieth century history — a context that preserves the character of an entire era of significant cultural activity. Listing intact groups of buildings helps preserve the sense of place enjoyed by Annie Malone, Herman Dreer, Charles Henry Turner, Julia Davis and other prominent African-Americans who either lived or worked in the neighborhood in its heyday. 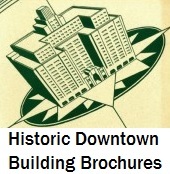 The city’s Cultural Resources Office (CRO) staff rewrote the Historic and Architectural Resources of the Ville MPS document, adding a well-written and must-read section (“Context III: The Ville as the Product of Residential Segregation Policies, 1910-1950”) that documents the larger settlement history as well as “registration requirements” for the building stock long not covered by the document. The Preservation Research Office submitted the three small historic districts that are the first to be nominated under the new section. View The Ville Survey in a larger mapThe three districts are not the only small residential districts eligible in The Ville, but are the only ones identified as eligible in The Heart of the Ville architectural survey conducted in 2009 and 2010. Additional surveys should be funded to identify other potential districts in The Ville. Meantime, there now are 90 more buildings eligible for historic tax credits in The Ville! Two-flats at 4220 and 4222 W. Cote Brilliante Avenue. 4222 was built in 1911 by W.E.C. Wahlus for developer J. Thomas. Rev. E. Duckworth built the large Colonial Revival single-family residence at 4221 W. Cote Brilliante Avenue in 1900. J.C. Ranken was the architect. 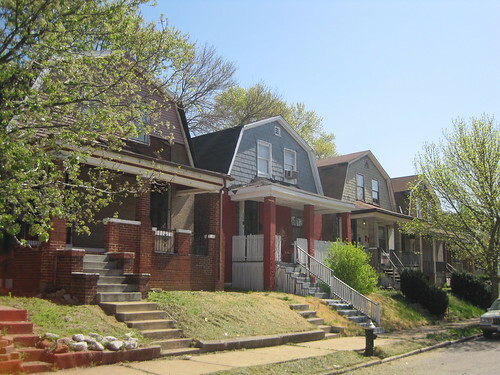 The Cote Brilliante Avenue in The Ville Historic District is an urban residential historic district located in The Ville neighborhood of north St. Louis, Missouri. The district encompasses parts of two sides of the 4200 West block of Cote Brilliante Avenue and two houses on adjacent lots on the west side of the 1700 block of Annie Malone Drive. There are 33 contributing resources in the district, including 32 one to 2 1/2 story residential buildings and one garage, as well as two non-contributing resources, both garages. The contributing residential buildings include two-story multi-family buildings, one-story single dwellings and one very large 2 1/2 story single dwelling at 4221 W. Cote Brilliante Avenue. All are brick, and most have architectural characteristics of the Late 19th and Early 20th Century Revivals styles. Contributing resources were built between c. 1890 and 1927, with most built between 1900 and 1915. Dutch Colonial houses with gambrel roofs on the north side of the 4200 W. block of Cote Brilliante Avenue. These houses were built in 1912 by J.F. White for developer C.A. Pitman. The remarkably-intact 4300 block of Aldine Avenue includes John Marshall School. The Marshall School Neighborhood in The Ville Historic District is an urban historic district located in The Ville neighborhood of St. Louis, Missouri. The district includes two buildings already listed in the National Register of Historic Places, the John Marshall School at 4342 Aldine Avenue and the Herman Dreer House at 4335 Cote Brilliante Avenue, 46 contributing primary buildings, all residential, 3 non-contributing primary buildings (two residences and a school building) and 3 non-contributing garages. Additionally there are 5 non-contributing resources in the district: two houses that have lost integrity and three garages built outside of the period of significance. The Marshall School Neighborhood in The Ville Historic District has an irregular boundary that includes parts of two sides of Aldine Avenue between Billups and Newstead Avenues, parts of two sides of Cote Brilliante Avenue between the same streets and a section of the western face of Billups Avenue to the north and south of Aldine Avenue. 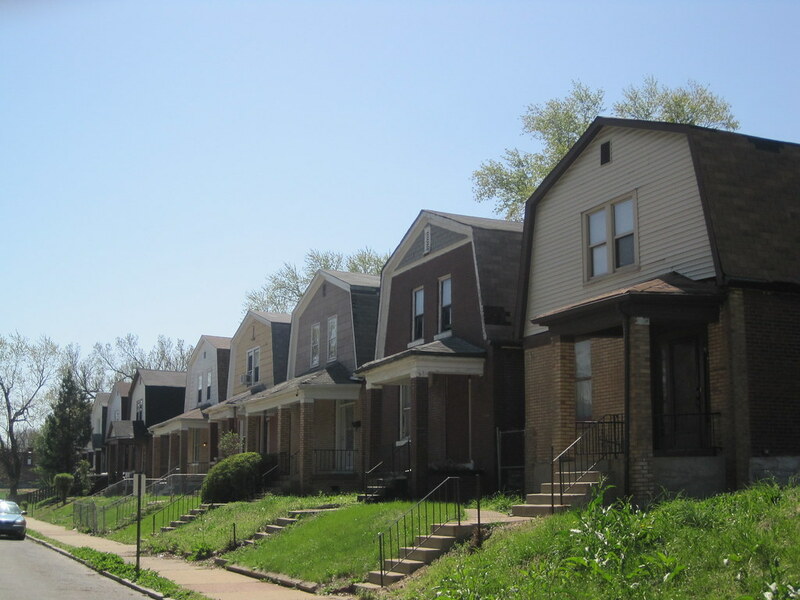 This row of Dutch Colonial single-family dwellings, preferred housing by teachers in Ville-area schools, is located on the south side of the 4300 block of Cote Brilliante Avenue. The Jefferson Realty & Trust Company developed the row in 1913. The contributing resources in the district were built between around 1875 and 1936. Aside from the imposing four-story John Marshall School, designed by renowned architect William B. Ittner, all other resources in the district are one to two-story residential buildings or garages. Due to the wide range of construction dates, the stylistic range runs from 19th century Italianate through mid-20th century Bungalow/Craftsman. 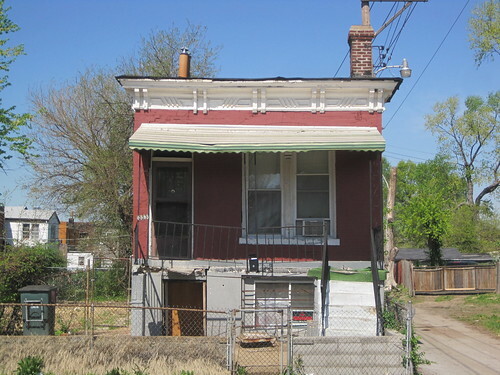 The district includes six one-story shotgun houses with Italiantate details on Billups Avenue. This house is at 1713 Billups Avenue and dates to 1892 and was built by H. Feuerbach. The residences at 4270 (left), 4272 and 4276 W. St. Ferdinand Avenue. 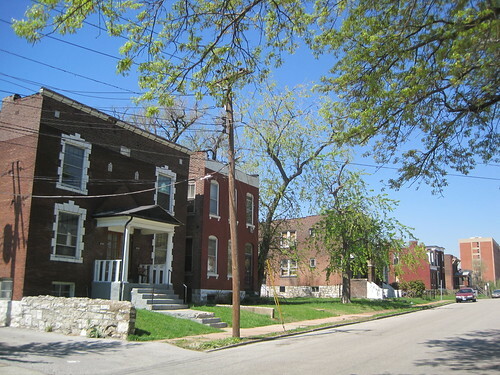 The St. Ferdinand Avenue in The Ville Historic District consists of most of the southern side of the 4200 West block of St. Ferdinand Avenue in The Ville neighborhood of St. Louis, Missouri. Included within the District are 14 contributing primary buildings, all residential, and one contributing shed, as well as one non-contributing primary building and one non-contributing garage. Across the street from the District is the south elevation of historic Sumner High School. All primary buildings in the district were built between 1884 and 1928. The majority of contributing buildings, nine, are one-story, flat-roofed residences built between 1884 and 1887. 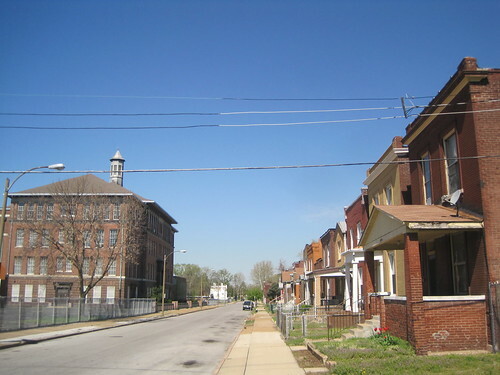 Looking west across the St. Ferdinand Avenue in The Ville Historic District. Several of the district’s buildings have high basement stories, stone faces and ornamental wooden cornices, and most of these nine are in the Italianate style. Other buildings include single-family dwellings, two-family dwellings and one four-family dwelling. The buildings are all flat-roofed, have stone foundations and masonry walls. Historically, not every lot on this block was built upon. 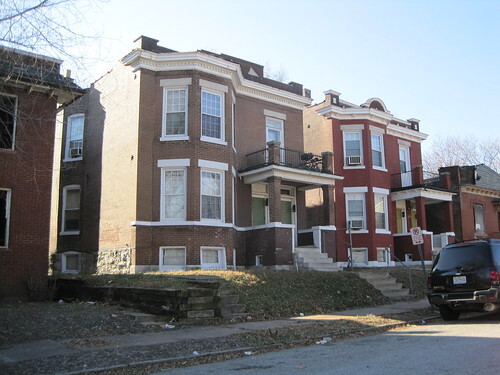 Within the District, the buildings at 4224 and 4236 W. St. Ferdinand sit on larger lots with side yards created on double-sized parcels within the period of significance.